How much data is generated every minute? 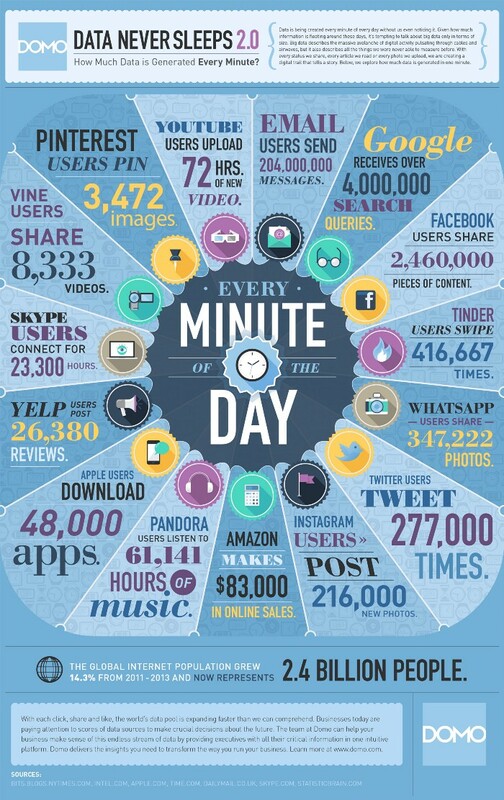 If you wonder how much data is generated every minute these days, here’s a simplified overview. Remember, this is done by just a part of the people who ‘live’ on the web: many people never tweet, upload a video to YouTube or pin something on Pinterest. They are just the consumers, the readers, the lurkers. However, all those big numbers turn small compared to the email army. In total, every minute, email users send 204,000,000 messages. That’s 12,240,000,000 emails per hour! That makes you think what a tough job the ISP’s and email providers like Gmail and Outlook.com have to sort through all those messages to see what’s good and what’s bad (spam) email. The source of the above image can be found here at Domo. The previous graphic of ‘How much data is generated every minute?’ can be found on the Domo-site here.